Doctor Web security researchers have examined two malicious programs for Linux. One of them installs a cryptocurrency-mining application on the devices it infects, and the other runs a proxy server. The first of the two was added to the Dr.Web virus databases under the name Linux.MulDrop.14. This malicious program attacks only Raspberry Pi minicomputers. 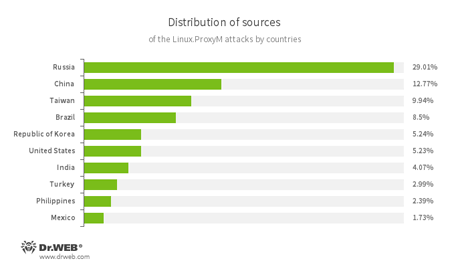 Criminals started distributing Linux.MulDrop.14 in the second half of May. The Trojan is a script that contains a compressed and encrypted application designed to mine cryptocurrency. Linux.MulDrop.14 changes the password on the devices it infects, unpacks and launches a miner, and then, in an infinite loop, starts searching for network nodes with an open port 22. After establishing a connection with them via the SSH protocol, the Trojan attempts to run a copy of itself on them. The Trojan uses a special range of methods to detect honeypots—special decoy servers used by digital security specialists to examine malicious software. Once launched, it connects to its command and control server and, after getting confirmation from it, runs a SOCKS proxy server on the infected device. Cybercriminals can use this Trojan to ensure that they remain anonymous online. Both of these Trojans are successfully detected and removed by Dr.Web products for Linux, and, therefore, they pose no threat to our users.